Posted by Jon in Marvel Legends, Review with 15 comments. Split build-a-figure series are the worst. It’s not just having to exhibit the patience needed, but it’s also having to deal with tracking down the second wave. Iron Man Legends came out around January this year with the first three figures of the series: Bleeding Edge, comic Iron Patriot, and Classic Iron Man. Those three together would build the lower body of Iron Monger. We then had to wait until around Toy Fair to find out the rest of the series: IM3 Iron Man Mark 42, IM3 Iron Patriot, and comic Ultron. The Mark 42 armor appears to be the official suit of Iron Man 3 so it makes sense that it would be an entry into the six-inch Legends line. Classic Iron Man – Repaint of the TRU Two-Pack with an additional new head. Dark Avengers Iron Patriot – Repaint of the Extremis Armor from the Terrax wave. Bleeding Edge Iron Man – I believe this is a new sculpt, yay! Ultron – Isn’t he more a Fantastic Four villain? 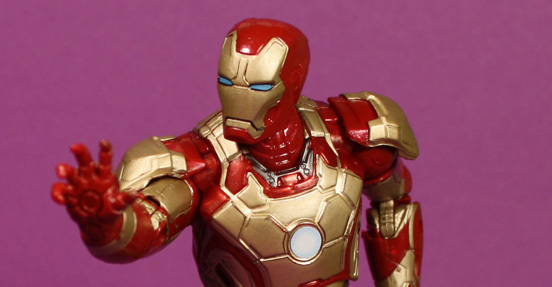 Iron Man Mark 42 – To be explored in this review! Iron Patriot – Looks like they reused the War Machine mold from IM2. So we have four comic based figures; of those one really isn’t even an Iron Man villain. We also get two Iron Man 3 movie figures who turned out pretty good. Two movie figures inserted into a Marvel Legends build-a-figure wave is not unheard of either. Remember when Hasbro had to fit all those X-Men 3 sculpts into the Legends line when the movie bombed? Iron Man movie armors tend to fit in pretty well with comic figures I guess I can give them a pass for mixing media this time. The Mark 42 armor has a very detailed sculpt. On top of this sculpt is a large amount of gold paint. What do we get when we combine a mass retail toy with a large number of specific paint details? We end up with a mixed bag when it comes to paint quality. I actually ordered two Mark 42 figures. One had extremely good paint applications, the other is all over the place. On the really good figure you can see an occasional section where the gold bled into the wrong panel, but for the most part the paint is very sharp. There is so much going on with the sculpt a few bleeding sections will go unnoticed. I did find it odd, however, that his arc reactor is actually a sticker. I noticed this because my “bad paint” version’s sticker came off inside the box. I’m not sure how I feel about a Marvel Legend’s figure using a decal for part of their body. It looks fine but if you let kids play with your toys they will more than likely end up getting that sticker off of the chest. This is also good to know if you are the type to play with your Iron Man action figures in the bath or shower. Being a Marvel Legend action figure, Mark 42 has all the right articulation. Hasbro has learned from their early day follies and included the double elbows and double knees. Iron Man also makes my Masters of the Universe Classics figures (except Bow) jealous with his double jointed wrists. His armor parts can get in the way of a few select poses especially in his hips, but I think the trade-off in aesthetic is fair. If you go to places like Target, Walmart, or Amazon you can get these guys for about $15 each. For a fully articulated figure with a build-a-figure part that isn’t a bad price at all. It’s a lot better than what you will pay for the Hit Monkey Marvel Legends wave which I can’t find for less than $20 each. Toys “R” Us will typically run you a little bit more, so if you have any of the other options I could go there first. It may be hard to find the second wave because everywhere I go I still see tons of the first series. The stores around me tend to skip on a second series if the first is still on the pegs, hence why I haven’t seen any new Marvel Legends this year. The Mark 42 armor serves a couple of purposes and does them both well. It provides people with an Iron Monger arm. It also provides movie fans with the signature armor of the current film. I think they did a great job with this armor, I’m very impressed with the wave altogether. Even to the point that I MAY go back and buy the first series just to finish the Monger. I’m not sure yet though, I still have a strict “No Marvel Legend” rule in my house that I broke when I saw these pop up on Amazon. I’m a sucker for getting something at a good price. Happy fourth of May Star Wars fans! Expect to see more Iron Man reviews this week! If i was you i mean i don’t mean to pick for you but get the Iron Patriot as he’s more colorful and detailed and just looks quite good but it depends also on what scale you get them so if you want Mandarin then i would just go with 6′ for that one. Not really, I love the 3.75″ inch line but the Iron Man 3 line is a bit too… kidish. The Iron Man 3 3/4″ line doesn’t even have articulation. There is nothing to love there. Is that cos most of them are assemblers? Oh okay well are they good? Ultron is mainly an Avngers villain, he was created by Hank Pym(Giant/Ant-man) a founding Avenger.. Thank you Morey! I’m so bad in comic back story. Fair enough Flutterlicious i understand what you mean!